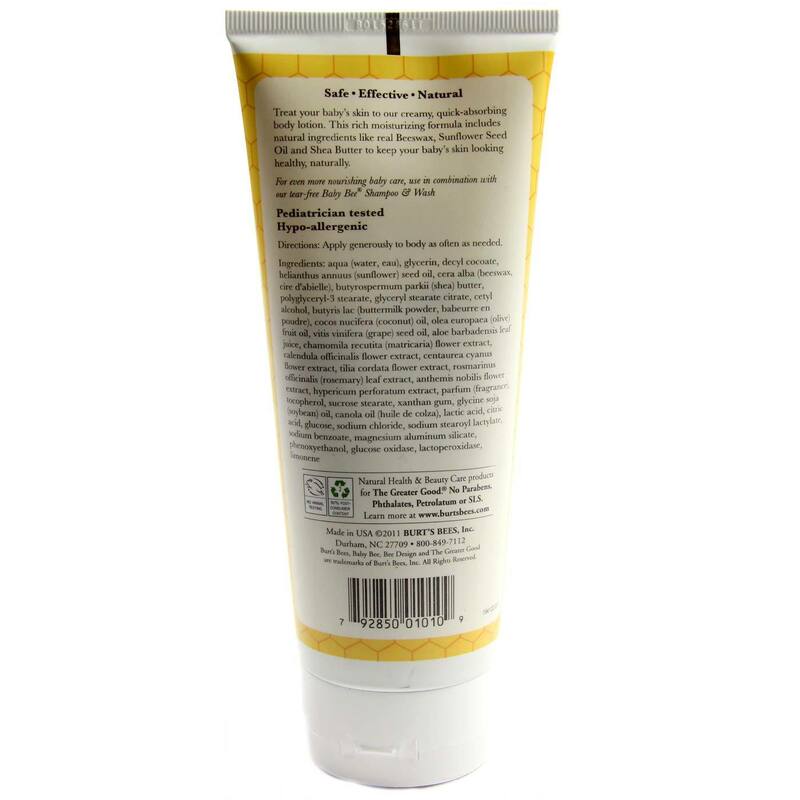 The Baby Bees Nourishing Lotion from Burt's Bees contains buttermilk, shea butter and sunflower seed oil for a natural moisturizer. Notas: No phthalates, parabens, petrolatum, or SLS. Hypoallergenic. Natural. Ingredienets: Aqua (water, eau), glycerin, decyl cocoate, helianthus annuus (sunflower) seed oil, cera alba (beeswax, cire d'abielle), butyrospermum parkii (shea) butter, polyglyceryl-3 stearate, glyceryl stearate citrate, cetyl alcohol, butyris lac (buttermilk powder, babeurre en poudre), cocos nucifera (coconut) oil, olea europaea (olive) fruit oil, vitis vinifera (grape) seed oil, aloe barbadensis leaf juice, chamomila recutita (matricaria) flower extract, calendula officinalis flower extract, centaurea cyanus flower extract, tilia cordata flower extract, rosmarinus officinalis (rosemary) leaf extract, anthemis nobilis flower extract, hypericum perforatum extract, parfum (fragrance), tocopherol, sucrose stearate, xanthan gum, glycine soja (soybean) oil, canola oil (huile de colza), lactic acid, citric acid, glucose, sodium chloride, sodium stearoyl lactylate, sodium benzoate, magnesium aluminum silicate, phenoxyethanol, glucose oxidase, lactoperoxidase, limonene. Recomendações de uso: Apply generously to body as often as needed. Burt's Bees Avaliações de Clientes.